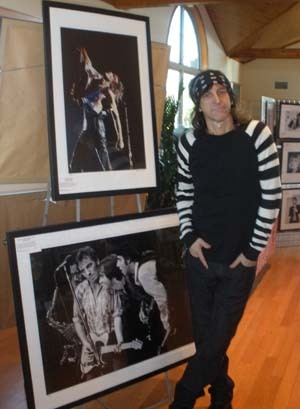 Mark Weiss with two of his R&R seminal photos. 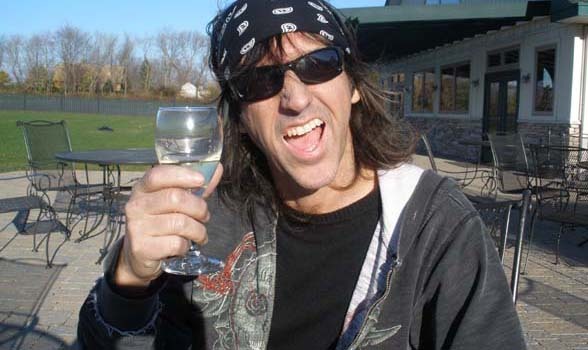 Camped out at the event for the weekend was Rock photographer Mark Weiss, and we sat out on the tasting patio for a brief interview. I asked Weiss how he got his start, "I grew up in Old Bridge, New Jersey and I started mowing lawns when I was 14 for $5 a cut. One guy told me that he mowed his own lawn, but if I mowed it for him, at the end of the season he would give me his camera. I had no interest in photography at the time, but I said, "Alright, why not?" True to his word, at the end of the season the gentleman gave Weiss his Bell & Howell Cannon camera, "No meter, just a clunker. I don't know why I did it, but I did it." Weiss started taking pictures of family and friends and set up a darkroom in his parents bathroom. After about a year and half Weiss got bored and put the camera on the shelf, only to pull it out a year later when his brother started riding moto-cross. With a renewed interest in photography, Weiss as a teenager would "tip" his way into concerts, get as close to the stage as possible and take pictures of the bands. The next day, after staying up all night developing them, he would return and sell his photos outside the concert for $1 a piece. This was all well and good until, "I got arrested when I was 17 at at KISS concert for selling the photos. I spent a night in jail and they told me if I wanted my pictures back that I had to return to court with my parents. I told them to keep the pictures." Although his career as a photo hawker ended, Weiss took his photos to the leading Rock Rag of the day, Circus Magazine. After an interview with the photo editor, he was told to come back if he thought he had something good. He eventually called and asked if they wanted some photos of Aerosmith. He brought them down and later picked up an issue of Circus only to find his first published photo, a centerfold spread of Steven Tyler, "I opened it up to see my name at the bottom. I remember I was in a phone booth in NYC at the time and tears of bliss would stream down my face.."
That was the start of a career that has led Weiss to become one of world's most successful Rock photographers. He has shot literally all the classic royalty of the R&R era, including backstage tour shoots all over the world, studio sessions and album covers. His first major cover was Ozzy Osbourne in a pink tutu and boxing gloves. Although Osbourne was at first upset by the placement of the shot, it drew worldwide attention and the publicity that any savvy rocker, like Osbourne, would welcome with open arms. Weiss was on his way! "The next thing you know I am doing another shot with Ozzy, then another shot. I am dressing him up and we are doing all these crazy shots, bunny outfits. We got all this publicity and the next thing you know I form this bond with him." Weiss is responsible for one of the most controversial and short lived covers in music history; the Bon Jovi wet tee-shirt, breast-pressed-against-glass cover of the "Slippery When Wet" album. It was just more than the album producers could handle. Anyone with a passion for Rock & Rock and its documentation in photos would be star-struck by the images presented at this exhibit and the presence of Mark Weiss at Duck Walk North, one of Rock & Roll's major visual chroniclers. I asked Weiss if he was ever star-struck in the pursuit of his career. His response was short and simple, "I still am!"